Social media provides an entirely new method for interacting with potential employers – but does it work, and is it worth it? Stop me if you’ve heard this story before (actually, let me finish because this is probably going to sound familiar): A young go-getter is in desperate need of a job, either because he’s about to graduate or he’s just been laid off. He turns to his social media accounts and within a relatively short amount time spent tweeting and status updating…ta-dah! Our hero has a job. Do enough digging through news archives and you’ll find that tale repeated over and over in various articles and blog posts about people using online social networks in their job search. The “Twitter [or whatever other network] is the future of job hunting” argument pops up in September 2008 and throughout every year since. If you type, “social media job search” into Google Trends, you’ll see a spike suddenly rise from flat nothingness in June 2009 and jaggedly make its way up to the terms’ highest popularity in Google’s search history ever, which is right now. The fact is social media doesn’t play as big a role in finding employment as the attention it gets. “Most of the hype about social media in the job search is just that – hype,” Mike Jungle, author of PurpleSquirrel: Stand Out, Land Interviews, and Master the Modern Job Market, said in a recent email exchange with Primer. Of course, that doesn’t mean that social media can’t play a role in getting someone hired or that it’s not becoming more accepted as a valid form of job recruitment. It’s sentiment that comes across again and again when one talks to employment experts and hiring managers: job hunting through social media isn’t as big a deal as made out by the news media, but it can (and should) still be used by job seekers. According to Ambrosia Humphrey, VP of Human Resources at HootSuite, one of the biggest names in the niche of Internet companies that handle social media management, the use of online social networks is just a natural addition to the arsenal of 21st century employment seekers. One person who understands just how to use social media to stand out while looking for new career opportunities is Mark Sutherland. Currently the chief communications officer for a marketing agency in St. Louis, Sutherland first realized the potential of online social networks in getting hired five years ago when a recommendation by a connection on LinkedIn was the factor that finally tipped the scales in his favor for a position at a large multinational company. 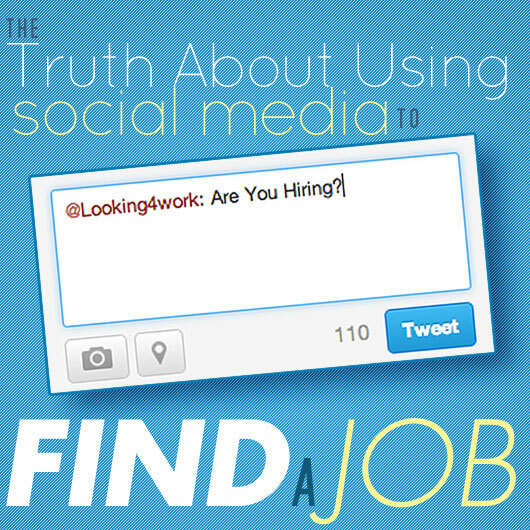 And that’s the secret for successfully using social media in job hunting. It should be mixed and incorporated with other offline strategies, not simply done on its own with the expectation of solving your employment needs. Social media is another edition to your job search tools and tactics — all of which you need to use together. Each network is different and feature their own unique value and format. And no one knows this better than the people hiring you. “Facebook is considered personal. Twitter is considered public. And LinkedIN is considered professional,” says Ambrosia Humphrey, who head up HR for HootSuite. “That’s the venn diagram that [Human Recourse] managers, all follow.” And while there’s sure to be some overlap (Facebook friends on LinkedIn and work contacts on Twitter), it’s best to stick to that division between the big three networks. Dave Odegard is a freelance writer and editor. He lives with his dog in Brooklyn, where he trains for marathons when not spending way too much time on the Internet. You can stalk him at DaveOdegard.com. I just got an offer on Thursday, kind of via social media. I interviewed with the company last year after finding a Craigslist post, but there ended up not being a position ready yet. I friended the person who interviewed me on Linkedin, though, and we kept in touch that way. Then last week, they had someone resign abruptly. Rather than go through an interview process with someone new that could take several weeks to a month, the hiring manager reached out to me via Linkedin and asked if I was still interested. I was, so I came in for a quick catchup chat and got the offer. Congrats! That’s a very smart strategy for using social media. Well done! Just proves that it’s not all what you know, rather than ‘who’. My question is, will you continue to maintain that LinkedIn profile now you have a job? Further, will you redesign and rewrite the contents of your page in a different tone (i.e. a non-job hunting tone)? If so, do you think it will make your new managers uneasy and wonder if you are looking to jump ship?